News Archive » We are surrounded by toxic chemicals: SCP/RAC provides 20 case studies to prevent their use and to find alternatives. We are surrounded by toxic chemicals: SCP/RAC provides 20 case studies to prevent their use and to find alternatives. The new publication of UN Environment/MAP - SCP/RAC intends to inspire and provide practical indications to phase out toxic chemicals in the Mediterranean region. SCP/RAC and the EU-funded SwitchMed Programme support entrepreneurs and CSOs to take action through technical assistance and seed funding. These solutions not only would benefit the environment in the MENA region but also provides socio-economic development. It is known that chemicals are being released into our environment daily which are then absorbed by wildlife and humans through the skin or ingested via food and water. 20% of these harmful chemicals are recognized carcinogens and many will cause allergies and hypersensitivity, damage to the nervous system, reproductive disorders, and disruption of the immune system. While the negative impacts are well known, little has been done to tackle the issue from a circular perspective. SCP/RAC, through SwitchMed, aimed at overcoming this lack by providing 20 concrete solutions and safe alternatives. 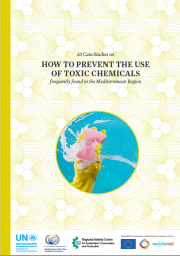 The approach taken in this publication is to emphasize the need for substitution and phase-out of toxic chemicals, preventing their use throughout the life cycle of materials and products. A list of more than 550 alternatives to problematic chemicals was screened to obtain a selection of 20 case studies describing a range of different uses and industries including automotive, agriculture and medical to industrial processes such as metal working, wood treatments and textiles. Other applications include consumer goods, such as plastic bags, personal care products, and childcare. The grouping used in this case study selection includes: Antimicrobials, bisphenols and phthalates, flame retardants, highly fluorinated substances, hazardous metals, solvents, plus an additional type which highlights one of the first kind of chemicals addressed by the Stockholm Convention and the Strategic Approach of International Chemical Management (SAICM): hazardous pesticides. The “20 case studies to prevent the use of toxic chemicals frequently found in the Mediterranean Region” publication is conceived as a practical tool for entrepreneurs and CSOs to identify the best solution for their context and be guided toward its successful implementation. Doing so, The Regional Activity Centre for Sustainable Consumption and Production (SCP/RAC), with the support of the SwitchMed Programme, calls the entrepreneurs, businesses, CSOs to take action and to adopt the solutions and alternatives showcased in the publication, and to prevent the use of toxic chemicals (POPs, PBTs, EDCs, vPvBs, CMRs) in products, which can be replicated in the Mediterranean Region by companies and avoided by authorities and consumers. The publication is also available in French. SCP/RAC: The Regional Activity Centre for Sustainable Consumption and Production (SCP/RAC) is a centre for international cooperation with Mediterranean countries on development and innovation in the production sector and civil society, based on more sustainable consumption and production models. The Centre develops its activity under the Mediterranean Action Plan (MAP) for the protection and development of the Mediterranean basin, an organization belonging to the United Nations Environment Programme (UNEP).